New findings about neuroplasticity are not only generally important for each of us but also for healing of brain diseases. The discovery of how great the plasticity of the human brain is is important and useful for everyone. We all have the capacity to keep developing our brains and this capacity remains into old age. Why this important for everybody is because what we do and how we live continuously influences how our brains stay vital and keep developing. Some ways of living can increase our chances of developing brain diseases and problems while other ways of living decrease these chances. As I wrote in this review of Erik Scherder's book, Laat je hersenen niet zitten, physical activity and cognitive challenge contribute to keeping your brain vital and healthy. The combination of these two activities promotes, among other things, the growth of new neurons, the survival of these new neurons, and the development of new connections between neurons. The discovery of the phenomenon of neuroplasticity is also important for healing of all sorts of brains diseases and brain damage. Norman Doidge's book The brain’s way of healing is dedicated to this topic. He describes three concepts which thinks enable neuroplastic healing and five phases which are often happening in neuroplastic healing. The three concepts are (slightly paraphrased): 1) learned nonuse, 2) noise in the brain, 3) rapid formation of new neuronal assemblies. The five phases are: 1) cellular repair, 2) neurostimulation, 3) neuromodulation, 4) neurorelaxation, 5) neurodifferentiation and learning. I'll briefly summarize these concepts and phases. example move their right arm). After having tried this for some time to no avail, they 'learn' or the brain learns that they can no longer do this and start to only do what they still can do (for example use their left arm). Researcher Taub has found that when you immobilize the well functioning arm and train the affected arm intensively, in many cases, much of the lost functionality, or all, can be regained. The second concept, noise in the brain, refers to the phenomenon that when brain damage happens not all neurons fall completely silent. Some neurons keep firing electrical signals but do this in an irregular and distorted manner. These irregular signals affect networks with which they're connected and form a background noise which can prevent the reception of good signals. The third concept, fast formation of neuronal assemblies, described the phenomenon that neurons work together in widely distributed networks which continuously renew themselves. These networks contain a considerable amount of redundancy due to which when certain parts of networks are damaged, other parts can take over their functionality. 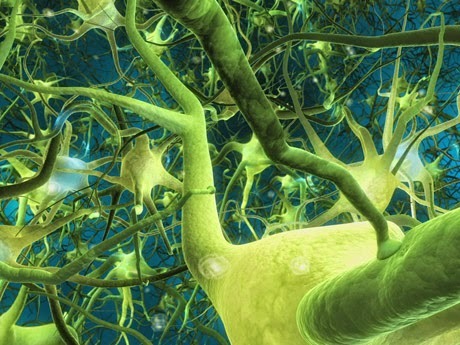 Phases: The first phase, cellular repair, is about the healing of neurons and glial cells after they have been damaged. The second phase, neurostimulation, refers to stimulation of brain cells by light, sound, electricity, vibration, movement, or thought so that the forming of new connections is promoted. The third phase, neuromodulation, is a phase in which the general level of arousal of the brain is reset which restores the balance between excitation and inhibition. In phase four, neurorelaxation, the person relaxes and catches up on lost sleep. In this phase the brain collects new energy needed for further recovery. In phase five, neurodifferentiation and learning, new skills are learned (or old skills are relearned) through a process of training of increasingly subtle distinctions in movements, sounds, images, or whatever is applicable for the affected function. These concepts and phases are described here in a rather general and abstract way. When reading the many examples in the book they become more clear. At the very end of the book there is suddenly a striking example of the content of the book. 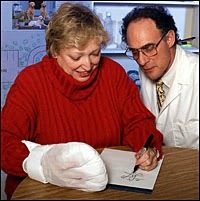 Halfway during the writing of the book, Jim Siberman, who had been Doidge's editor since 2000, had a serious stroke due to which he could move his left arm and left leg anymore. After Silberman was released from hospital rehab he received very little follow up. When he expressed hope of discovery to his neurologist, he was told by him that "he must not be fooled by any post-stroke improvements he had made: he would soon plateau and make no further progress." Silberman did not accept this and started to apply many principles which are mentioned in Doidge's books among which Taub's therapy. He resumed editing the book and when the book was finished he had restored most of his lost functions. Not only a striking example of the importance of neuroplasticity for healing brain damage but, unfortunately, also of the lagging medical practice.